Handed over the responsibility of captaining India in the first two ODIs against New Zealand in Mahendra Singh Dhoni's absence, opener Gautam Gambhir on Sunday said leading the national team in the upcoming series is a dream-come-true moment in his career. Gambhir was on Saturday named captain of India's ODI team for the first two ODIs against New Zealand after the selectors decided to rest five senior players, including regular skipper Dhoni. "It's a dream-come-true moment for any player to lead his country. I am obviously excited about it and hopefully we would do well," Gambhir said after the second day's play in the third and final Test between India and New Zealand in Nagpur on Sunday. Asked whether his concept and visualisation about captaincy is different from Dhoni, he said, "I know that there are ups and downs in captaincy. I have experienced that while leading the Delhi Daredevils and Delhi Ranji Trophy side. Everyone has a different way of going about his job. It's more about being instinctive. "You can't think beforehand about a particular situation. You have got to take instinctive decisions and back yourself." If the left-hander was excited about the prospect of leading the national side, there was disappointment on missing out on a three-figure mark having got out on 78 after playing a loose shot off Tim Southee's bowling. "You want to make the most of the opportunities. So it's pretty disappointing that despite being involved in two century partnerships in back-to-back Test matches, I couldn't convert it. Hopefully, we will get those in South Africa," Gambhir said. About how the match has panned out, the opener feels that the ball has already started turning and a first innings lead of around 300 can clinch the issue for the home team. Asked about his lack of runs much throughout the past season, Gambhir attributed it more to his recurring knee injury rather than poor form. "After the Asia Cup, I wasn't playing three or four Test matches at one go. When you play three to four Test matches, it helps a lot to get back into form," he said. Gambhir was full of praise for his opening partner Virender Sehwag's blistering 73-ball 74-run knock that has given other Indian batsmen chance to play their own game. 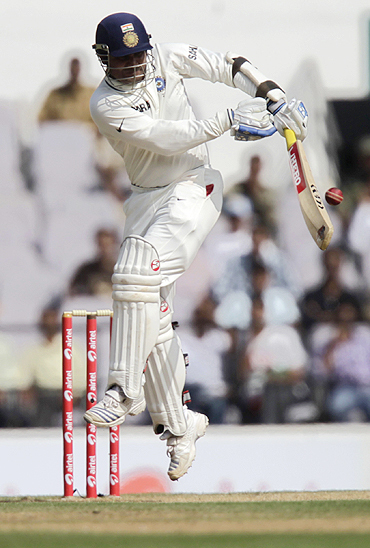 "There aren't too many players who can play in the same manner in all three forms of the game apart from Sehwag. Before the opposition realises, you are 50 for no loss and that is really of great help. "Personally also, he has helped me a lot when we were playing in Hyderabad. He was constantly encouraging me and that really helped me," said the gutsy opener. Asked whether his approach is similar to Sehwag in troubled times, he said, "We are two different individuals and we think differently. While I would prefer to play as many balls possible and spend considerable time out there in the middle, he (Sehwag) would start attacking the bowlers from the word go." The perfect team man that Gambhir is became evident when he was asked whether standing at forward short-leg being one of the reasons for his recurrent knee injuries. "I know it's difficult when you stand at forward short-leg. But then you don't have any specialist in the team for that position. Until and unless someone else comes, I have to stand there as that's a job I have been assigned," he said. On a lighter vein, he was asked whether he would still stand in that position when he is the captain, he smiled and said, "Yes, I would still stand in that position."